With growing interest in health and nutrition, interest in beets is on the rise but most people do not know what to do with them. Roasting beets is a wonderful entry-level skill to develop. In fact, learn to roast beets and you can use those little darlings as the base for some of the most impressive dishes you could serve. It just requires a little patience from you while the oven does the work. 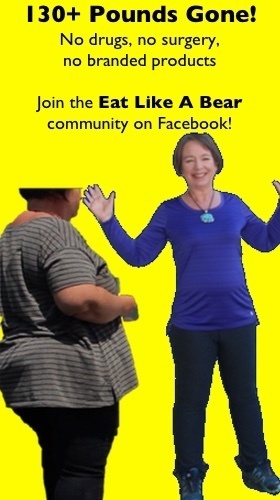 Try each of these methods and find what works for you. Trim the tops to within an inch of the stems. Do not cut down into the beet. Scrub the beet but do not peel. Arrange the beets on a cookie sheet leaving plenty of room around each beet. Roast in a 375 degree oven for about an hour and a half. The time will vary depending on the size of your beets. You want each one to be easily pierced with a sharp knife. Remove from the oven when the beets are roasted through. Unwrap them and let them cool enough to handle. Peel the cooled beets. The skins should just slip off. You are now holding a cooked beet that has almost caramelized. The flavor is intense, but quite sweet. Store the roasted beets in an airtight container in the refrigerator for as long as a week. They are yours to slice or cube, to use in salads, as the base of a soup, and in baked goods. You have endless possibilities in a container of roasted beets. This approach is a little more work, but what comes out of the oven is ready to eat and it doesn’t take long for it to disappear. Cut the beets into uniform cubes, as uniform as they get of course. Aim for half-inch cubes. Toss them with enough light olive oil (or your favorite high-heat oil) to fully coat each cube and dust with some sea salt or zaatar. Spread the cubes on a cookie sheet with sides, giving each cube a bit of breathing space. Do no pile the pieces on top of each other. Roast at 375 degrees in a preheated oven for about 55 minutes. Toss once or twice during the roasting time. The beets should be soft all the way through the cube. The outsides may be getting a bit crusted over by the time they are totally cooked. Remove the cubes to a serving bowl or tray. They are delicious warm or at room temperature. Because they are crusted over, there is less chance that these cubes will recolor anything you mix them with. This process describes roasting your beets whole. Trim the beet tops leaving about 1 inch of stem. Scrub the beet but do not peel it. Cover the beets in foil or secure them in a covered casserole dish to lock in the moisture as they roast. For foil-wrapped beets, arrange them on a baking sheet leaving plenty of room between beets. Roast in a 375 degree oven for about 90 minutes. The roasting time will vary with the size of the beet. They are done when you can pierce them easily with a sharp knife. Remove the beets from the oven and allow them to cool, unwrapping them as necessary. Peel the cooled beets and use! Q: Can I roast my beets without using foil? A: Yes, definitely. 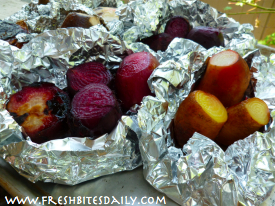 The reason for the foil is to keep the beet from drying out during roasting. As an alternative, use a casserole dish with a lid. Arrange your beets in the dish to roast and keep the lid on while they are roasting. Q: Do roasted beets pair with goat cheese? Q: Can I roast my beets with other vegetables such as carrots or sweet potatoes? A: Absolutely. It’s an efficient use of your oven to roast a tray full of vegetables. Line them all up, leaving some space in between. Ideally, they would all be a similar size so that their cook time is also similar, but you can certainly check smaller items first and remove them from the oven and then return the larger items to finish roasting. Q: Can you eat skin-roasted beets? A: Yes, for sure. We roast beets in their skins to help retain their moisture. However, we do remove the skin before eating them. It can be a little on the tough side. Q: How to peel roasted beets? A: The beet peel will come off the whole beet easily after it roasts. It will nearly fall off but it just needs a little help! Q: How to reheat roasted beets? A: The most straight-forward way to reheat the beets is in a skillet with a bit of water. Place a lid on the skillet and reheat them over medium heat. Q: Can you freeze roasted beets? A: Yes, roasted beets freeze well. Use the “tray freeze” method — spread them out on a tray and freeze them on the tray. Once frozen, scoop the beets off the tray and place them in a freezer bag or other freezer container for longer-term freezer storage. Q: How long will roasted beets keep? A: Your roasted beets will last about a week in your refrigerator. 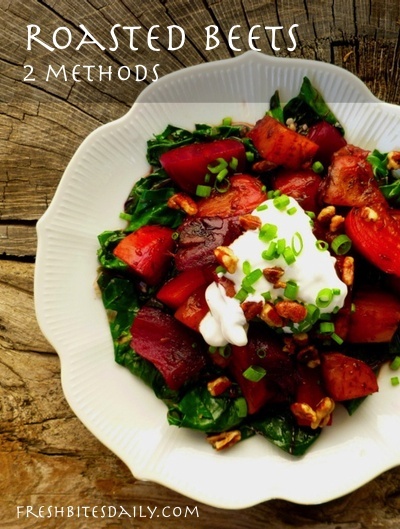 Beet recipe love: How to eat all of those beets? 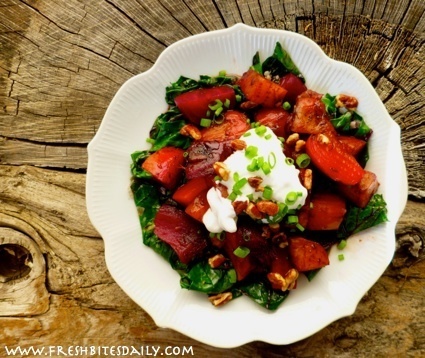 3 Comments on "Roasted Beets: 2 Approaches To Up Your Beet Game"
I recently tried baked beets for the first time and was impressed at how simple and delicious they are. I have never tried roasting them as cubes but I think I will try that when I have some on hand. In Arizona we grow beets from September to about March or April. They seem to take four or five months to grow large enough to be worth harvesting. I have never heard that beets can be roasted. I am looking forward to try this dish tonight and hoping to give a surprise to my family members. What an interestingly unique way to prepare beets! thanks!